Size: Medium (7-8), Color: Blue is currently out of stock! Includes dress, petticoat, and headband. Real adventures begins with our favorite old classic fantasy stories. Are you planning to bring Alice in wonderland characters in real life from reel life? You have come at the right place. 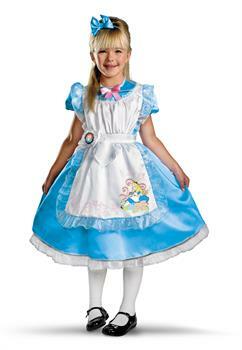 If you thinking about whimsical characters from old classics for costume theme then Alice in wonderland is perfect for you. You must dress up her in the most iconic party dress and let her feel special about herself. She will look amazing in our marvelous costumes. Show your creative mind with Disney Alice in Wonderland - Alice Deluxe Toddler / Child costume.